Four-and-3/8 inches long when folded, this is a full-sized and full-featured knife large enough to handle the primitive skills and construction problems of any scout troop. The Adventurer's main blade locks back for greater safety, and the liner lock mechanism releases with fingertip pressure. The assortment of tools is smaller than some Swiss Army designs, but that limited number of blades makes the knife less bulky and easier to handle. The sturdy red handle slabs cover stainless steel liners and high carbon stainless steel blades, durable and easily maintained. Choose between can opener and bottle opener when it's time to fix a meal, or use the same blades for tightening slotted screws or stripping wire. The single Phillips screwdriver blade will take some practice but works if you're careful. The knife's reaming awl with sewing eye could make that moccasin project go smoothly, and the tweezers and key ring could find occasional important uses as well. By far the busiest tool in my Swiss Army Knife has been that handy plastic toothpick -- a real lifesaver at times, or at least a great comfort. 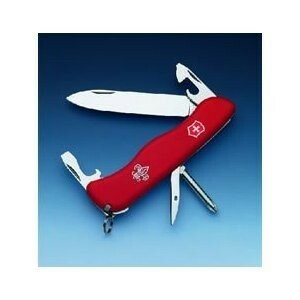 Chances are very good you'll never need Victorinox's lifetime warranty, but it's standard. See the Victorinox Hercules Swiss Army Knife for a larger version of this classic pocket knife with a wider assortment of handy tools and blades.